ABOARD THE VIKING SKY – Don’t know how he could see with all that long hair in his eyes. But he seemed to gallop along just fine when he spied a hand reaching out to pet him. On this sunny day, the Viking Sky has docked in Lerwick, Scotland, and I have signed up for the Shetland Panoramic and Ponies shore excursion. I couldn’t miss the chance to see these historic little critters. 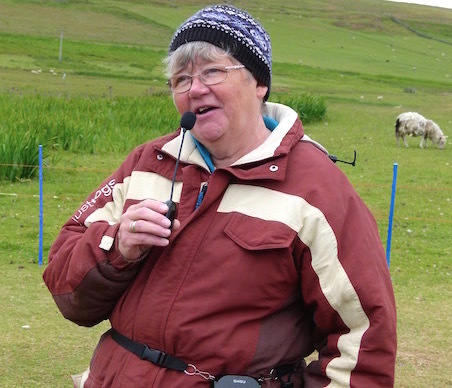 Carol Fuller talks about her Shetland ponies and their history. Carol has 20 mares, six stallions and two geldings, including an adorable nine-week-old baby who didn’t stray far from his mother. A Shetland pony gestation period is 11 months. 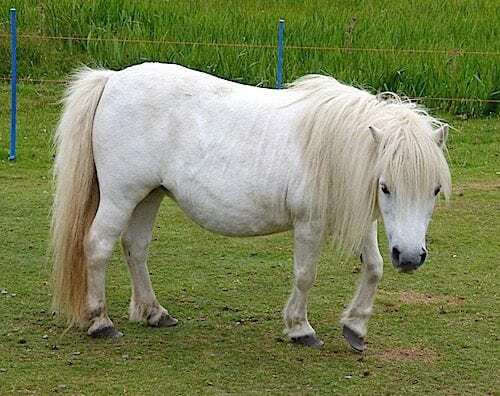 Originating in the Shetland Isles in Scotland, the Shetland pony ranges in size of a minimum height of about 28 inches to an official maximum height of 42 inches. The ponies don’t have any one color, Carol said. 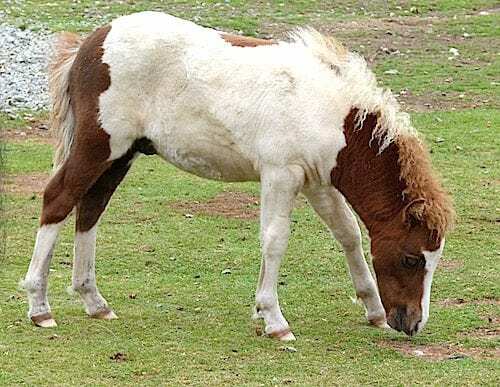 Shetland ponies can come in any color as other horses except spotted. “They can be seen in any colors known in other horses except for spotted,” which is an Appaloosa-type coloration, Carol said. The pony’s coats change according to the season, Carol said. 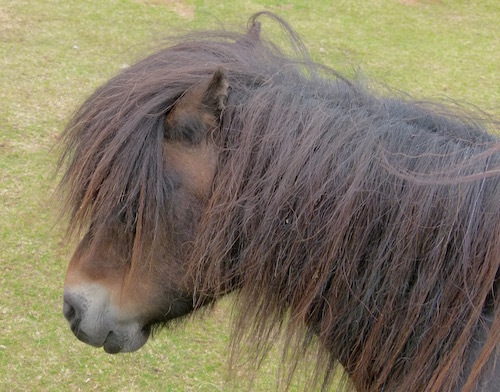 In the summer, the pony’s coat is shorter with a beautiful silky sheen. The winter coat is double size with guard hairs to shed the rain. When one of our passengers asked Carol if the ponies are sheared to remove their excess hair when warm weather arrives, Carol answered that the ponies and Mother Nature take care of it themselves. Babies are born in the fields and older ones die in the woods. There is plenty of open space for the ponies to roam and natural shelter if needed. Shetland ponies have a life expectancy of about 30 years. Because of their hardiness, small size, intelligence and unusual strength, Shetland ponies were used in the 1800s in British coal mines. They were also used as workhorses to cultivate the land and transport peat as fuel to heat homes. “A Shetland pony can pull twice its own weight,” Carol said. In comparison, a hefty draft horse can pull only about half its own weight. 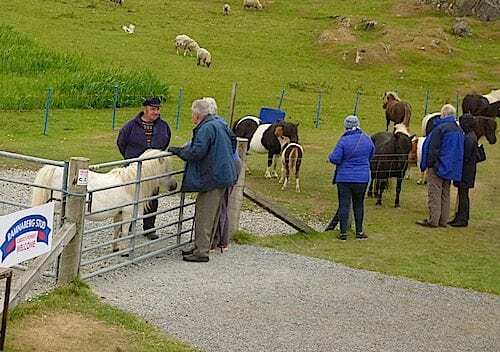 Carol’s Ponies is a popular stop with cruise ship passengers. Today, Shetland ponies are used mostly for pleasure – for riding, horse shows and as pets. On the way to visit Carol and her ponies, we stopped to view a large ruined castle that seemed out of place in the village of Scalloway. But, of course, the castle was there long before those newer homes and other buildings. 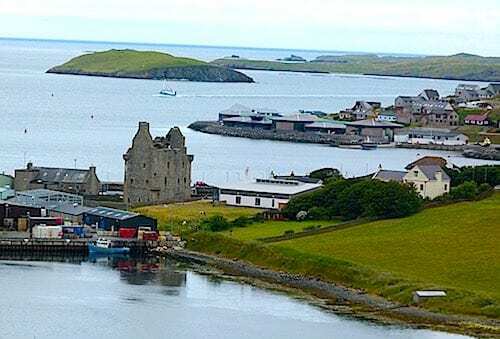 Scalloway Castle was built in 1599 by Earl Patrick Steward. Rather, the cruel ruler forced people to build the castle for him. Tales abound that workers’ blood was used in the mortar mixture but that has never been proven. The tyrant also had a secret room built in his castle where he could make a quick escape if enemies ever entered his fortress. Earl Patrick Stewart taxed people heavily but he made a big mistake. He didn’t pay his share of taxes to the Crown. So, some men were sent to arrest him. Earl Patrick Stewart was beheaded in Edinburgh in 1615. For a while his castle was used for local administration and justice but by the end of the 17th century, it had fallen into disrepair. That is how it sits to this day.